Note: Eye may also refer to: Eye (Hurricane). The eye is the organ of sight. The eye enables creatures to perceive light in various ways, from simple lightness versus darkness, to full-fledged color vision. In the human, and most mammals, the eye consists of several structures. The cornea is a protective outer layer. The iris is an aperture through which light enters. The lens is controlled by muscles to focus the light on the retina at the back of the eye. The retina has many specialized cells (photoreceptors) that are able to react to light and send their signals via the optic nerve to the brain for interpretation. There are two types of photoreceptor cell called rods and cones. Rods are by far the most numerous (around 120 million) and are sufficiently sensitive to allow basic black/white vision even at very low light levels. Cones (6-7 million) only function at higher light levels, but enable us to perceive color. Typically eyes come in pairs, to allow binocular vision and hence depth perception, but most spiders (for example) have eight eyes (though some have less or none at all), and scallops may have several dozen. The eye worm Loa loa, a parasitic nematode worm, inhabits the vitreous humour of the human eyeball in parts of Africa, and is often only detected when somebody sees the worm swimming across inside the eyeball. Numerous, unrelated organisms possess eyes of varying degrees of complexity. Evolutionists allege that these all evolved independently to meet a common need; this is discussed in some detail in Climbing Mount Improbable, by Richard Dawkins. Creationists commonly argue that, in order to offer even basic functionality, the eye must be so complex as to preclude an evolutionary explanation for its development. They therefore view the eye as a perfect example of Irreducible Complexity. This applies most strikingly to the eyes of the larger molluscs, octopuses, squid and cuttlefish. 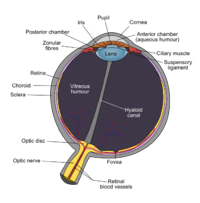 Evolutionists tend to claim that the eye could have indeed formed through means of natural selection, this starting from a small layer of cells. An eye with only one lens is a simple eye. The word 'eye' appears over seven hundred times in the Bible.